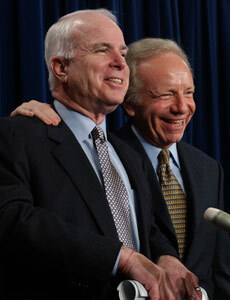 Senators Joe Lieberman (I – CT), John McCain (R – AZ) and Lindsey Graham (R – SC) are in Israel today discussing as they so often do the prospect of America launching yet another massive, ill-conceived war, this time against Iran. Sen. McCain opened with comments suggesting he did not believe that Israel, which has repeatedly threatened to launch a military attack on Iran, was close to making any such decision. Sen Lieberman was quick to add that he believes that even if Israel doesn’t attack, the US is prepared to. The officials went on to condemn Turkey for its “hostile rhetoric towards Israel,” with Senator McCain calling Turkey’s behavior “disturbing.” Turkey, a long time ally of Israel, was critical of last month’s Israeli attack on a Turkey aid ship, an attack which left eight Turkish aid workers and one American dead.